Marine Bahamas is an iPhone/iPad universal application which gives you access to all the catalogue by Wavey Line Publishing. "I long to be, once again in the sea"
An international team of scientists who monitor the rapid changes in the Earth’s northern polar region say that the Arctic is entering a new state – one with warmer air and water temperatures, less summer sea ice and snow cover, and a changed ocean chemistry. This shift is also causing changes in the region’s life, both on land and in the sea, including less habitat for polar bears and walruses, but increased access to feeding areas for whales. Changes to the Arctic are chronicled annually in the Arctic Report Card, which was released today. The report is prepared by an international team of scientists from 14 different countries. “This report, by a team of 121 scientists from around the globe, concludes that the Arctic region continues to warm, with less sea ice and greater green vegetation,” said Monica Medina, NOAA principal deputy under secretary of commerce for oceans and atmosphere. Atmosphere: In 2011, the average annual near-surface air temperatures over much of the Arctic Ocean were approximately 2.5° F (1.5° C) greater than the 1981-2010 baseline period. Sea ice: Minimum Arctic sea ice area in September 2011 was the second lowest recorded by satellite since 1979. Ocean: Arctic Ocean temperature and salinity may be stabilizing after a period of warming and freshening. Acidification of sea water (“ocean acidification”) as a result of carbon dioxide absorption has also been documented in the Beaufort and Chukchi seas. Arctic Report Card: Update for 2011 - Tracking recent environmental changes, with 23 essays on different aspects of the environment, by a team of 112 international authors, and independently peer-reviewed by the Arctic Monitoring and Assessment Programme of the Arctic Council. In 2006, NOAA’s Climate Program Office introduced the State of the Arctic Report which established a baseline of conditions at the beginning of the 21st century. It is updated annually as the Arctic Report Card to monitor the often-quickly changing conditions in the Arctic. Peer-review of the scientific content of the report card was facilitated by the Arctic Monitoring and Assessment (AMAP) Program. The Report Card tracks the Arctic atmosphere, sea ice, biology, ocean, land, and Greenland. This year, new sections were added, including, greenhouse gases, ozone and ultraviolet radiation, ocean acidification, Arctic Ocean primary productivity, and lake ice. The Arctic Report Card is available online. NOAA’s mission is to understand and predict changes in the Earth's environment, from the depths of the ocean to the surface of the sun, and to conserve and manage our coastal and marine resources. Researchers have discovered what makes the shark almost impossible to outswim. By using an engineering imaging technique, researchers have discovered that as a shark’s tail swings from side to side, it creates twice as many jets of water as other fishes’ tails, smoothing out the thrust and likely making swimming more efficient. Sharks do this by stiffening the tail midswing, a strategy that might one day be applied to underwater vehicles to improve their performance. “The authors have made a persuasive argument that muscles in the fin are modifying the shape and possibly the texture of the fin to modify the [water] flow” throughout the stroke cycle, says Frank Fish, a biomechanist at West Chester University in Pennsylvania. For fish to move forward, they have to push water backward. And sharks have an added burden: they sink when they stop swimming, so they must be in constant motion. To help generate lift to keep midwater, the top of the tail extends farther back than the bottom, creating a slant along the back edge. Most other fish have tails that are essentially symmetrical from top to bottom. Curious about how the shark tail works, Harvard University biomechanist Brooke Flammang has been examining its structure and function. In 2005, she discovered a tail muscle that seemed to activate at peculiar times during the tail’s swing back and forth. To understand the muscle’s role, she decided to track in fine detail how the shark pushes water backward. To do this, researchers typically put a lot of small particles in the water. As the tail swings, the water moves and drags the particles along. The particles reflect light from flashing lasers, so they can be tracked using high-speed cameras. A computer program uses the images to generate pictures of water flow. The jets of water are hard to see, but these jets create rings or vortices of water that resemble smoke rings and can be readily detected. Typically, this imaging technique employs two cameras to track the particles in the horizontal and vertical directions, and based on that data, researchers estimate how the particles move along the third dimension, depth. But Flammang wanted to see directly how particles moved in three dimensions. So she adapted a more advanced imaging system, one that use three cameras, that until now had only been used to study water flow coming off cylinders with pistons generating the force. “Engineers have employed this technique for years, but its application is new to biology,” Fish notes. Flammang and her colleagues tested two spiny dogfish and two chain dogfish by putting them in a water tank with a constant water flow so the sharks swam in place. She also looked at the water flow coming off a shark “robot” that had a flexible plastic tail. Most fish create a ring of water at the end of each tail flick. The tail pushes the water as it moves to the side, then sends the water twirling away as it stops to change direction. Sharks were thought to produce two rings at that point, one small and one large one because of the shape of the tail, and that’s what happens with the robotic tail. But in reality, a shark’s tail spins off the second ring right as it reaches the midline of the animal, Flammang and her colleagues report in the 22 December issue of the Proceedings of the Royal Society B. That ring is larger and connects to the ring generated at the end of the tail flick. “That provides a big advantage,” Flammang says. Instead of just getting a push as the tail reaches the extent of its bend, the shark has added thrust midswing. Flammang thinks the shark uses the muscle she characterized to stiffen the tail midswing, changing its shape slightly, to throw off the extra vortex. The mako shark is the fastest shark in the sea, giving it a distinct advantage over its prey. Learn what makes the mako shark swim so fast on Discovery Channel's "Perfect Predators." “The shark has one more degree of sophistication” in generating thrust, says Michael Triantafyllou, an ocean engineer at the Massachusetts Institute of Technology in Cambridge. ElasmoResearch : How fast can a shark swim ? 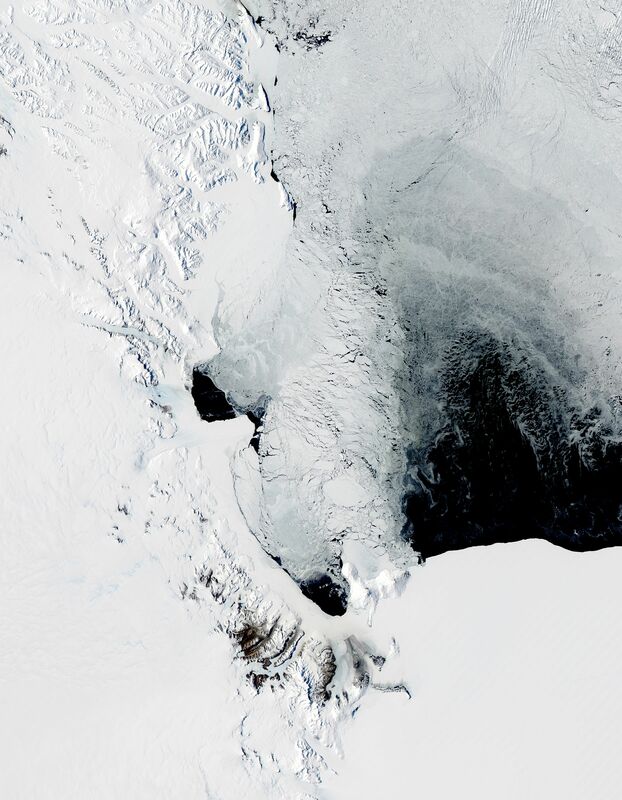 A polynya, or persistent area of open water, caused by strong winds or warm water rising, this polynya off a coast of Antarctica is a strange site..
NASA image courtesy Jeff Schmaltz, LANCE/EOSDIS MODIS Rapid Response Team at NASA GSFC. Caption by Michon Scott, based on image interpretation by Walt Meier and Ted Scambos, National Snow and Ice Data Center. Winter conditions in the Arctic and Antarctic lead to the formation of sea ice. But in some places where sea ice should occur, open water appears instead. Persistent areas of open water amidst sea ice are known as polynyas. Often the result of the upwelling of warm ocean water, polynyas can also result from winds. 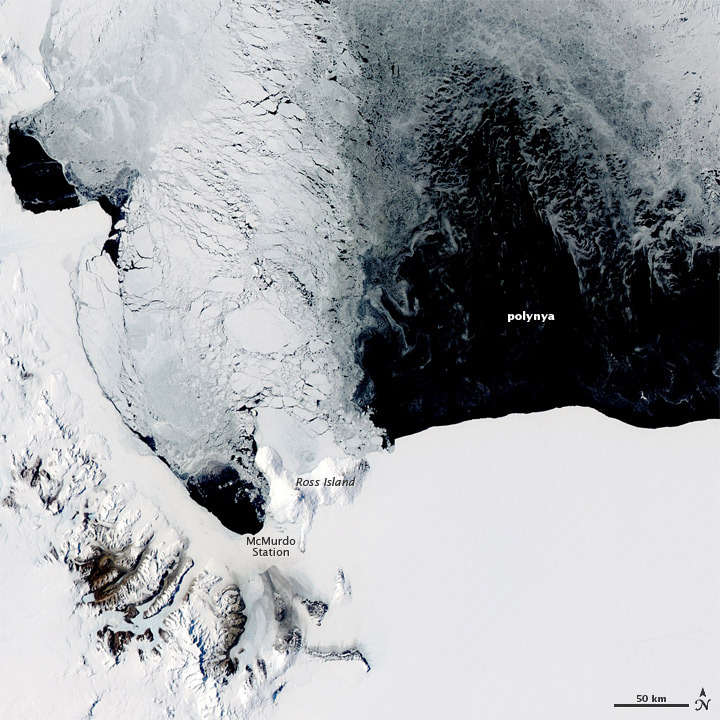 The Moderate Resolution Imaging Spectroradiometer (MODIS) on NASA’s Aqua satellite captured this natural-color image of a polynya off the coast of Antarctica, near Ross Island and McMurdo Station on November 16, 2011. The winds blow off Antarctica’s high interior toward the ocean and can attain hurricane strength—up to 200 miles (320 kilometers) per hour. Strong winds have pushed sea ice away from the coast in this image, but not uniformly. Ross Island and the mountains to the west block some winds, so sea ice lingers near those landforms. Along the lower-elevation area east of Ross Island, winds clear the ice from a large stretch of ocean. North of the polynya, sea ice shows varying degrees of thickness, perhaps the result of alternating windy and calm spells. Polynyas, ice shelves, and sea ice were prime targets for IceBridge, a NASA mission that uses airplanes equipped with radar and lidar to develop a three-dimensional view of Antarctic ice. The 2011 Antarctic campaign concluded on November 20. You can learn more about the mission in IceBridge: Building a record of Earth’s changing ice, one flight at a time. All about Sea Ice. Polynyas. National Snow and Ice Data Center. Accessed November 21, 2011. Antarctica: The End of the Earth. Unequaled extremes. PBS Nature. Accessed November 21, 2011. Fish lover's paradise. Archaeologists have found evidence of deep-sea fishing 42,000 years ago at Jerimalai, a cave on the eastern end of East Timor (inset). In a shallow cave on an island north of Australia, researchers have made a surprising discovery: the 42,000-year-old bones of tuna and sharks that were clearly brought there by human hands. The find, reported online today in Science, provides the strongest evidence yet that people were deep-sea fishing so long ago. And those maritime skills may have allowed the inhabitants of this region to colonize lands far and wide. The earliest known boats, found in France and the Netherlands, are only 10,000 years old, but archaeologists know they don't tell the whole story. Wood and other common boat-building materials don't preserve well in the archaeological record. And the colonization of Australia and the nearby islands of Southeast Asia, which began at least 45,000 years ago, required sea crossings of at least 30 kilometers. Yet whether these early migrants put out to sea deliberately in boats or simply drifted with the tides in rafts meant for near-shore exploration has been a matter of fierce debate. Indeed, direct evidence for early seafaring skills has been lacking. "The evidence was pretty slim," she says. That is until she excavated a shallow cave called Jerimalai on East Timor, an island nation just north of Australia. In the earliest levels of Jerimalai, dated to 42,000 years ago, about half of the fish are fast-swimming species, such as tuna and sharks, that live in deep waters. O'Connor's team also found a fishhook at Jerimalai made from a mollusk shell and dated to 23,000 years ago, which the team claims is the earliest definite evidence for line fishing. (There are claims for fishhooks in Europe going back about 20,000 years, but the dating is less certain.) in Canberra. Photos show both sides of a fish hook that was apparently used to pull in tuna, sharks and barracuda 42,000 years ago. The scale indicates centimeters. The new evidence "certainly suggests that people had advanced maritime skills" by 42,000 years ago O'Connor says, at least "in terms of fishing technology." The finds indicate that this mastery of the sea "must have been one of the things that allowed the initial colonization" of East Timor and other Southeast Asian islands, such as Papua New Guinea and Indonesia. But O'Connor cautions that there is still no direct evidence about the maritime skills of the first people who colonized Australia, leaving open the possibility that they drifted there with the tides. Archaeologist James O'Connell of the University of Utah in Salt Lake City, who has argued that "a broad range of evidence" points to deep-sea fishing between 45,000 and 50,000 years ago, says that the new evidence from Jerimalai "solidifies the case." But William Keegan, an anthropologist at the Florida Museum of Natural History in Gainesville, points out that the relatively small size of the tuna found at Jerimalai—mostly between 50 and 70 centimeters long—suggests that they were immature, juvenile fish that might have been caught close to shore. And Geoff Bailey, an archaeologist at the University of York in the United Kingdom points out that East Timor and the other islands in the area have very steep offshore topography, meaning that the deep waters favored by adult tuna and sharks are very close to land. These species, Bailey says, "would likely come very close inshore and be catchable without necessarily requiring people to set off in boats." O'Connor counters that even juvenile tuna are "fast moving," adding that "there is no way they could be speared off the beach or the reef." Fishing hooks and other evidence of maritime technology have yet to be found in the earliest levels at Jerimalai, but she and her team plan to continue excavating there in an attempt to find them. The Permanent Service for Mean Sea Level (PSMSL) has launched the latest of its interactive maps that allow users to explore changes to sea level as observed by tide gauges. The anomalies map demonstrates how sea level varies from year to year when compared the long-term average at that site, calculated over the period from 1960 to 1990. Moving the slider along the time line shows how sea level can vary by over 20 cm from year to year at some locations. When you first load the page showing the sea level anomalies, the background trend at each tide gauge is not removed. Thus, a majority of the early years are dominated by blue colours showing negative anomalies and the later years by red colours showing positive anomalies as the average global sea level rises. There are notable exceptions to this pattern, however. For example, the land surrounding the Baltic Sea is uplifting as the earth continues to recover from the collapse of the large ice sheets that covered the region during the last ice age. This causes sea level measured by tide gauges to decrease. Thus, the anomalies in that region go from red to blue over the time span of the data. To remove this background trend at each site, use the tick box below the map. Earlier in the year, the PSMSL also introduced an interactive map for exploring the trends in the data : to explore the trend more thoroughly, use the trend explorer. This map lets one see how the estimate of a constant change in time (a trend) for each of tide gauge records depends upon the period of the data used in the calculation. Zooming out to show the world, we see that the vast majority of the sites are red, indicating a sea level rise. It interesting to note the change in geographic coverage of the data over time. By choosing the entire time span, 1900-2010, you can observe the lack of data covering this period in the Southern Hemisphere and western Pacific. More data is available if the start date is moved up to 1950, but unfortunately there is still a lack of geographic coverage in the Southern Hemisphere. Established in 1933, the PSMSL is responsible for the collection, publication, analysis and interpretation of sea level data from the global network of tide gauges. It is based in Liverpool at the National Oceanography Centre (NOC), which is a component of the UK Natural Environment Research Council (NERC).